Your Needs are Our Priority! You are our priority. You are a unique human, deserving of respect and compassion, from your first phone call. Our team will always see you and care for you as an individual. You deserve nothing less. We provide patient-centered care, where you are a name, not a number. Starting with your initial complimentary consultation, we’ll work to get to know you. We’re concerned about more than your smile dreams: we want to know who you are, to learn about your family, and your interests. We want to develop a friendship, and for you to know we are here for you. We’ve created a practice that’s welcoming and inviting. Our patients and families tell us they feel at home as soon as they arrive, and always comment on our Key West-theme artwork. As you step through the doors you’ll be surrounded by smiles and laughter. Alot of our patients know eachother through various schools, sports, groups and organizations and some friends have met during their visits to our office. Our patients say they love coming to visit us, and we love their visits. It’s fun to see how much progress each person is making on their new smile. It’s just as enjoyable for us to hear the latest about our patients lives, activities and awesome vacations. Whatever accomplishments we're celebrating for school or work, there’s always something to smile about at Schumacher Orthodontics. 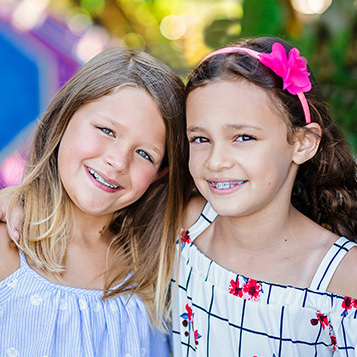 Many people mistakenly think orthodontic care is only available or appropriate for younger people. This is probably because you usually see metal braces on younger patients. However, today’s advanced treatments allow adults and even seniors to develop the amazing smile they’ve always wanted: virtually invisibly! Schumacher Orthodontics offers clear brackets and Invisalign® clear aligners. These leading-edge treatments mean your teeth can gently be shifted into proper alignment, with no-one knowing you’re undergoing treatment. People will notice, though, that you’re smiling more often and with greater confidence. Before committing to orthodontic treatment, it’s important you understand your clinical needs and the care options available. It’s equally as important you choose a practice where you know you’ll receive the best care, delivered by people you trust. We invite you to schedule a complimentary consultation at our Indian Harbour Beach, FL orthodontic office. We welcome patients from Melbourne, Indialantic, and Satellite Beach, and the rest of Brevard County. Please call to schedule a consultation, today. Dr. Schumacher and our team look forward to welcoming you to our office. We’d love to make your smile dreams comes true!